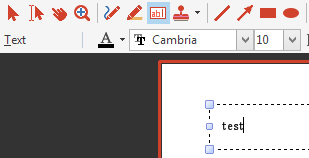 "How can I set the default font for the text tool? My settings always get lost." This is a question we hear a lot. To answer it, let me explain how text tool properties work, and what you need to do to change the defaults. you overload the default settings by switching to a predefined tool. To understand what that means, let me first explain how font settings work. ... and set the font you want to use. I'm going to set it to "Open Sans". 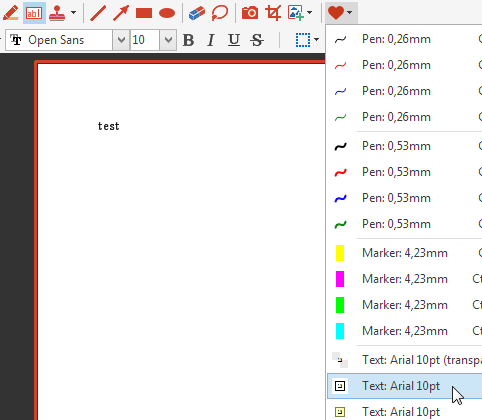 Now, when we close PDF Annotator, and open it again, we will see that the font setting was preserved. In my example, it is still "Open Sans". So, this is the current default for new text boxes. Again, would you close and open PDF Annotator now, you will still find "Open Sans" being the default font. But, when you switch to a predefined tool, either through the toolbox (the tabs on the bottom left), or the Favorites toolbar, this will override the default settings! The predefined tool you selected will become the new default. 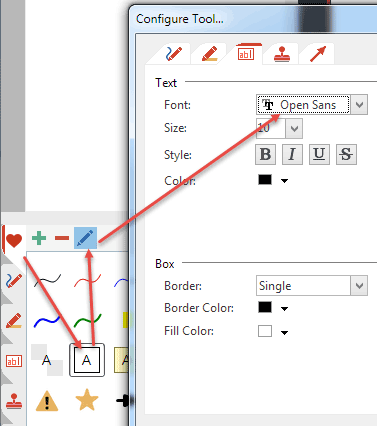 Having said this, if you make use of predefined tools, you need to change the settings for these tools, so that they use the font settings you prefer! By the way, what I showed above with the font sample, of course also applies for all other properties - and also for other tools (like pen, marker, line, circle...).